Sally goes for a trip to the beach and finds a limpet attached to a rock. She pulls and pulls at it, and eventually it comes loose – and attaches itself to her finger. The story follows Sally’s travails as she and everyone else she knows tries to remove the limpet from her finger. Simon James is not a writer I was familiar with until I picked this up in the library; and in fact I only picked it up because it was about a girl called Sally. However, as you can see from the picture above, this a very pretty book and well worth a read. The watercolour illustrations are beautifully drawn and capture the naivety of its young character. The story does the pictures justice. Sally has to go home from the beach with the limpet still stuck on her finger, as her (rather macho looking!) father can’t get it off. People try everything to remove the creature but to no avail. At school, her teacher tells her that limpets live for years and spend all that time on the same rock. I love that that information is delivered to us as readers with no comment and no emphasis, it’s just put there on the page and left. 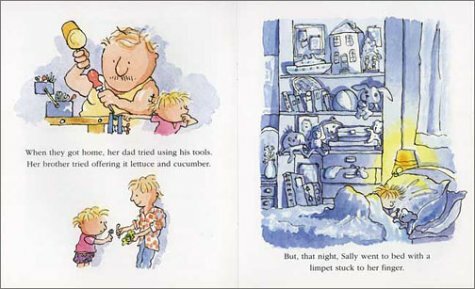 Which means that when Sally begins to feel rather upset at the doctor’s increasingly aggressive attempts to remove it and makes a run for it, it is for once not immediately obvious what she is doing and why. Sally, without direct adult involvement, returns the limpet to his rock, and the contrast between the dramatic attempts to get it off and the simple way it eventually leaves – “the limpet, feeling at home once more, made a little squelching noise and wiggled off her finger” – is very effective. It is a straightforward but very moving lesson in personal responsibility and in not interfering with things that are nothing to do with you. 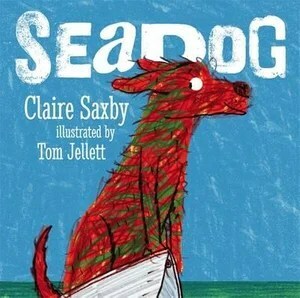 An entertaining story with a meaningful subtext, this is writing for children at its best. It has potential as a text for early years study and could easily fuel a discussion about sea creatures, or what’s right and wrong and responsible when you find an animal at the beach. Look out for more Simon James reviews as they are clearly worth exploring further! This is an old book but a real classic that has been used in classrooms for many years. First published in 1977, it is one of those books in which all the elements of a good children’s story come together to form something special. Mr Grinling is the lighthousekeeper. He lives in a cottage on the side of a hill directly opposite the lighthouse. Every day, Mrs Grinling packs him a (quite frankly delicious) lunch and hangs it on the wire that connects the house and the lighthouse, so it travels across to him. But one day, a pack of voracious seagulls discover their system and help themselves to the lunch. By the time it gets to Mr Grinling, there is nothing left. The next day, Mrs Grinling ties the napkin on to the basket to protect it, but this is no match for the scavenging birds. Next she tries sending the cat over in an identical basket to defend the lunch, but he is so terrified that he cowers pathetically in the bottom and pays no attention to the seagulls. Then, finally, she has an ingenious idea that puts the seagulls off for good. A classic story, original and funny with lots to talk about.